MILWAUKEE — Lorenzo Cain plans to be back in the lineup Sunday afternoon when the Milwaukee Brewers wrap up a four-game series with the Atlanta Braves at Miller Park. Cain had been on the disabled list with a sore groin since June 26 and was eligible to return Wednesday, but the final step of his recovery took slightly longer than expected. He went through a full workout Saturday afternoon at Miller Park and after getting through it without issue declared himself ready to go. “I’ll be playing tomorrow,” Cain told reporters as he walked off the field after his workout. Since signing a four-year, $80 million contract with Milwaukee in January, Cain has been a force in the batter’s box and in center field. He was slashing .291/.394/.438 with eight home runs and 26 RBIs in 72 games for the Brewers, numbers that make him a leading candidate for a spot when All-Star rosters are announced Sunday evening. The 32-year-old has made an All-Star team once in his career — in 2015 with the Kansas City Royals, but Brewers manager Craig Counsell said the chance of Cain landing a spot on the National League roster had no bearing on his return timeline. 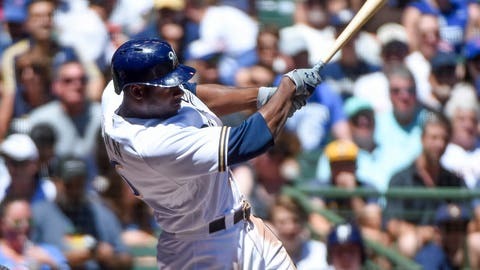 Reinstating Cain will require another roster move for the Brewers. The team has managed its roster on a nearly daily basis this season, shuttling fresh arms and hot bats back and forth between Milwaukee and Triple-A Colorado Springs. Part of it, naturally, has been based on need, but part of it is also an attempt to create the strongest roster possible on any given day. Junior Guerra (5-5, 2.87 ERA) was part of that shuffle already this season. He opened the year with Colorado Springs and was brought back to Milwaukee when the need arose. The right-hander hasn’t let up since and takes the mound Sunday afternoon looking for a victory in a third consecutive start. Guerra threw five shutout innings in a no-decision in his only appearance versus Atlanta in 2016. The Braves counter with left-hander Sean Newcomb (8-3, 3.10), whose last outing was one he’d like to forget. Pitching through sweltering heat and humidity, Newcomb was tagged for five runs, three hits and five walks while working 2 2/3 innings at Yankee Stadium. Newcomb was 7-1 with a 2.07 ERA in the 11 previous starts and will be looking to revert to that form Sunday when he faces Milwaukee for the first time in his career.